Now that you've finished filing your taxes, here's another task sure to clog your calculatortallying the cost of the auto bailout. With General Motors Corp. running through $10 billion in cash from the federal treasury during the first three months of 2009 and Congress poised to offer consumers substantial tax credits for new, more fuel efficient vehicles, the costs of helping the struggling automobile industry are mounting fast. Throw in special financing for auto loans supported by the Federal Reserve Board, and the aid for automakers now totals $83 billionand it keeps growing. In a less celebrated aid package, the U.S. Treasury has advanced $5 billion to automotive suppliers in an effort to keep them out of bankruptcy. In addition, several automakers, among them Ford Motor Co., Volkswagen, Nissan, Honda and Mitsubishi, have applied for assistance under the Federal Reserve Board's Term Asset-Backed Securities Loan Facility or TALF. The TALF, which was set up last fall, was designed to subsidize the sale of asset-backed securities, a critical source of funding for car loans, student loans and credit card receivables. Don't put down your pencil yet. 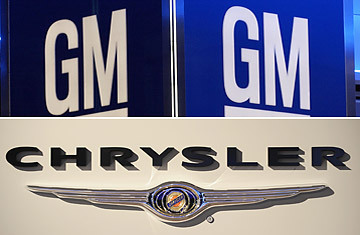 The Obama Administration also has agreed to support GM and Chrysler's warranties as part of its bailout plans. The two companies have trimmed warranty expenses in recent years, but based on financial information from both automakers the potential federal liability required to back up Obama's pledge could ultimately run into the billions of dollars. Almost lost amidst all the headlines about crisis aid to the automakers, the U.S. Department of Energy is now preparing to release $25 billion in loans appropriated last autumn to speed up the transition to more fuel efficient vehicles. The cash is supposed to be used for specific projects that increase fuel economy. Ford, for example, has applied to use some of the federal cash to convert an assembly plant in suburban Detroit from building trucks to building small cars and electric vehicles. The project costs $550 million and Ford hopes to use some of the DOE cash. GM, Chrysler, Nissan and Tesla, the California manufacturer of an exotic electric sports car, are also applying for some of the funds. Meanwhile, automotive suppliers have petitioned the Treasury Department for an additional $8 billion and GMAC, which is now a bank, will need $11.5 billion in new capital according to the U.S. Treasury Department's stress tests. As if all that weren't enough, GM predicted in February that bankruptcy, which now looks inevitable after the company's disastrous first quarter, could cost as much as $100 billion.